The melting of glaciers is often cited as evidence mankind is causing global warming through carbon dioxide emissions. A corollary of this is that melting glaciers raise sea levels, which will reach catastrophic levels unless CO2 emissions are reduced. Adding to the massive evidence already refuting these assertions, a recent paper provides more accurate reconstruction of two centuries of previous data “by using many more stations, particularly in the polar regions, and recently processed historic data series from isolated island stations.” The new study is based on monthly mean sea level data from 1807 to 2010. Regarding this new study, well-known meteorologist Anthony Watts wrote “this newest analysis of the most comprehensive data set available suggests that there has been no dramatic increase—or any increase, for that matter—in the atmosphere’s CO2 concentration. [Therefore, there is no evidence of any human influence on sea levels. ]” The last sentence, in brackets, is Mr. Watt's. Two other recent studies link link conclude that global warming of two glaciers in Antarctica will undermine the entire West Antarctic ice sheet, causing it to collapse and slide into the ocean. The authors contend that the Pine Island and Thwaites glaciers are melting on their undersides due to warm ocean water. As a result, the glacier is no longer held in place, they say. As pieces of the ice shelf break off, the ice behind slides forward. The authors assert “...we find no major bed or obstacle that would prevent the glaciers from further retreat and draw down of the entire basin.” This, they suggest, would raise sea level 10 feet or more in coming centuries. Dr. Don Easterbrook, geology professor emeritus, Western Washington University, provides an illuminating explanation of why this dire prediction will not come true. With the aid of excellent maps, he provides a useful perspective on the geologic setting, the location of mountains, the drainage patterns and outlets of the two glaciers, and the scale of the size and thickness of the West Antarctic ice sheet relative to the Pine Island and Thwaites glaciers. For example, the East Antarctic ice sheet has more than 90% of the continent's ice; the West Antarctic ice sheet, only about 8 and 1/2%, and the Pine Island Glacier only about 10% of that. But most surprising—and convincing—is Easterbrook's statement: “The importance of ice thickness is that virtually all of the ice sheet is considerably thicker than the depth below sea level to bedrock, so the ice is grounded and will not float.” He demonstrates this with the graph below accompanied by the following explanation. “The IPCC only needs CO2 for the climate models and only for the northern hemisphere.... The anthropogenic CO2 based theory is based strictly on computer models – the empirical data do not support it. “The United Nations IPCC was founded in 1988 with the purpose of assessing “the scientific, technical and socioeconomic information relevant for the understanding of the risk of human-induced climate change.” —i.e. it is based on the assumption of “human-induced climate change” – there was no attempt to evaluate the scientific evidence of the cause of the warming....[The IPCC] always makes statements regarding the definite human causation; it has never provided substantial scientific evidence that anthropogenic CO2 is the cause. The only evidence provided is the output of computer models. About a decade ago there was rising concern about the melting of Mt. Kilimanjaro's icecap, which was widely blamed on global warming. That presumption did not fit with the available data. Measurements were made of the Kilimanjaro icecap in 1912, 1953, 1976 and 1979. Kilimanjaro lost 45% of its icecap between 1912 and 1953. 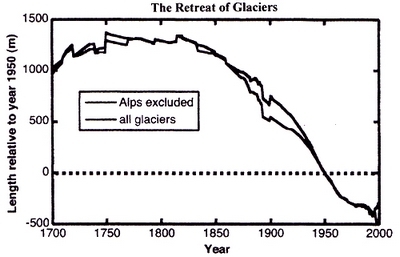 Had that trend continued, those glaciers would already be gone. But the period 1953 to 1976 was a period of global COOLING (minus 0.13 degrees F.)—and Kilimanjaro's glaciers still lost another 21%. Another 12% disappeared since 1976, the lowest rate since 1912. Thus contrary to the hype of the global warming alarmists, Kilimanjaro's icecap melted more slowly in recent decades, not faster. Moreover, since 1979 we have satellite measurements, which are far more accurate than ground-based measurements and give us measurements at various elevations. At the height of Mt. Kilimanjaro, 19,000 feet, they show a cooling of the Kilimanjaro area of 0.40 degrees F. beginning in 1979. This cooling rate (0.17 degrees F. per decade) is exactly the same as the warming rate 1912 to 1953. Kilimanjaro is just one more example of trying to scare the public with a global warming story that has no basis in fact. Mason's work has since been confirmed by several other researchers. Ten major ice ages have occurred during the past one million years, and another ten occurred in the prior million or so years. These ice ages lasted about 90,000 years and were separated by warm interglacial periods lasting about 10,000 years. We are currently in the Holocene interglacial period. Since this began about 11,500 years ago, we are no doubt very late in this cycle, after which the earth will again experience an ice age. Sea levels have fluctuated widely as the ice advanced and retreated in accordance with the 90,000- and 10,000-year cycles. Since the most recent period of maximum glaciation, 18,000 years ago, the sea level has risen more than 300 feet without CO2 emissions from industrialization. A land bridge had existed across the Bering Strait, so it was possible to walk from Siberia to Alaska. The hype of global warming alarmism claimed the temperatures in the 1990s were “unprecedented” and required drastic limiting of CO2 emissions to prevent “catastrophic” global warming. But if we compare the mean temperature of the 1990s to the warmest temperatures of the four prior interglacials, we see the 1990s were much cooler than all of these corresponding periods. In fact, all four were warmer than the current one by an average temperature of more than 2 degrees C.
120,000 years ago, during the last interglacial period, the Eemian, global sea level was about 8 m (26 feet) higher than today. Globally, temperatures were 1-2 degrees C. higher, and the water temperature of the North Sea was about 2 degrees C. higher than today. The climate in Greenland during the Eemian period was about 8 degrees C. higher than today. At the beginning of the Eemian, 128,000 years ago, the ice sheet in northwest Greenland was 200 meters higher than today. It regressed during the warm Eemian period, so by 122,000 years ago that ice sheet had sunk to 130 meters below the current level. The foregoing facts show that current temperatures, glaciers and sea levels are well within the natural range of fluctuations. Far more extreme climate conditions existed many times in the past without ever causing the catastrophic consequences predicted from the far more modest climate changes we see today or are likely to see in the future. Arguments to the contrary are simply baseless and implausible. Since the greenhouse effect of CO2 is so minor, all of the computer models assume it will be amplified by water vapor, without which there would be no disaster scenario. But in the many documented periods of higher carbon dioxide levels, even during much warmer climate periods, such amplification never happened. During the time of the dinosaurs, the carbon dioxide levels were 300-500% greater than today. Five hundred million years ago, the level of carbon dioxide in the atmosphere was 15-20 times what it is today. Yet the catastrophic water-vapor amplification of carbon dioxide warming never occurred. Today we're told catastrophe will result if carbon dioxide doubles. But during the Ordovician Period the carbon dioxide level was 12 times what it is today, and the earth was in an Ice Age. That's exactly opposite to the "runaway" warming that computer models predict should occur. It is also implausible that mankind has a significant—much less a decisive—effect on atmospheric CO2. Of the CO2 that constitutes 5% or less of the greenhouse effect, 97% of that comes from nature, not man. By far the largest source of carbon dioxide emissions is the equatorial Pacific Ocean. It produces 72% of the earth's emissions of carbon dioxide, and the rest of the Pacific, the Atlantic, the Indian Ocean, and the other waters also contribute. Volcanoes, swamps, rice paddies, fallen leaves, and even insects and bacteria produce carbon dioxide, as well as methane, which is a far more potent greenhouse gas than CO2. Termites alone emit far more CO2 than all the fossil fuels burned annually, and plant respiration and decay emit 10 to 15 times more CO2 than termites, according to P. R. Zimmerman of the National Center for Atmospheric Research. Human emissions are trivial to the climate. So why all the hysteria about controlling global warming? It's really not about global warming at all. It's about controlling people for ideological reasons. It would be futile to campaign against global warming from water vapor. Or the sun. (See my previous posting, “It's the Sun, Stupid.”) But if you can scare the public that global warming is a threat to humanity and the future of the planet because of CO2 and industrial progress, they are likely to vote for those proposing “solutions” for controlling people and progress to avert disaster even if it isn't real. Global warming is a way of smuggling collectivist ideology into political power, broadening economic controls, social engineering and effacing individual rights, all under the banner of collective good. The global warming issue is really a political ticket to a dangerous future of centralized control. It is the future version of George Orwell's 1984. If the government says something is “true,” it is, even if it isn't. If it says global warming is occurring, that is “true,” even if it isn't. If it says it is caused by CO2, that is “true,” even if it isn't. If EPA says CO2 must be regulated because it is a health hazard, that is “true” even if it isn't. It isn't just that the alarmists are trumpeting model results that we know must be wrong. It is that they are trumpeting catastrophes that couldn't happen even if the models were right. --Richard Lindzen, climatologist, MIT professor of meteorology.